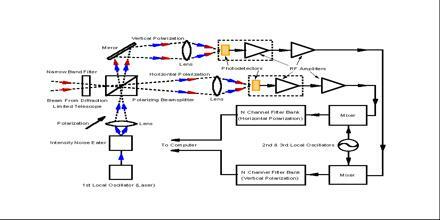 Optical Heterodyne Detection involves optical signal and local oscillator waves, whereas the mixing product is an electrical signal. It is a detection method which was originally developed in the field of radio waves and microwaves. In heterodyne detection, a signal of interest at some frequency is non-linearly mixed with a reference “local oscillator” (LO) that is set at a close-by frequency. The desired outcome is the difference frequency, which carries the information of the original higher frequency signal, but is oscillating at a lower more easily processed carrier frequency.